Wellcome to GK Solve blog. Today GK Solve Share a Important Employment gadgets News Paper in PDF.Now a day Job is Most Important things in our Life. and Govmt. Job is Secure to everyone.So We need well prepair and Daily updates for All indian Job news. 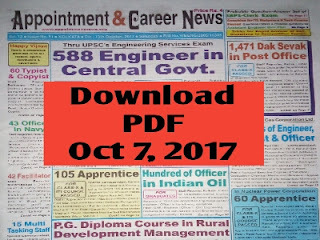 and regular practis subjecteise.To day we share Appointment & Career news paper to help you for Updates all latest Job and well preparation for Job. 1.1471 Dak Sevak in Post Office. 2. 588 Engineer in Central Govt. 5. 100 Officer in Indian Oil. Or, Go to Facebook and Scerch ' GK Solve' For more update and Job News daily. For details news And Pattern Question Syllabus Download Full PDF. 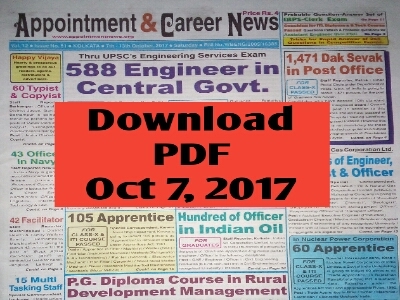 Google Drive download link : Appointment & Career News Oct 7, 2017 Click Here! If you Help from the blog, please Share the blog Address to your facebook, whatsapp friends and read daily. we need yours Support.